If you are a Broadliner, RefrigiWear’s line of bags, blankets and pallet covers can provide peace of mind when it comes to protecting those temperature-sensitive products. Our products can help prevent product degradation and loss during storage and transportation. Insulated Pallet Covers and Bags are great for protecting a product like ice cream, which is stored at -15°F, but when placed on a 0°F truck will increase in temperature. By placing the ice cream under a pallet cover or in a bag, the rise in temperature is much slower and degradation is minimal. Insulated Blankets are beneficial to protect product stacked against bulkheads and as a divider when product at different temperatures is stacked on one pallet. Be aware that about 25% of all food products transported in the cold chain are wasted each year due to breaches in integrity leading to fluctuations in temperature and product degradation.2 With RefrigiWear’s line of insulated products, we can find a solution for any application. Even if something doesn’t fit just right, we’re the experts in customizing products to fit your needs. Our 150P Insulated Pallet Covers are great for protecting pallet-load quantities of all perishable products which include produce, dairy or frozen products. 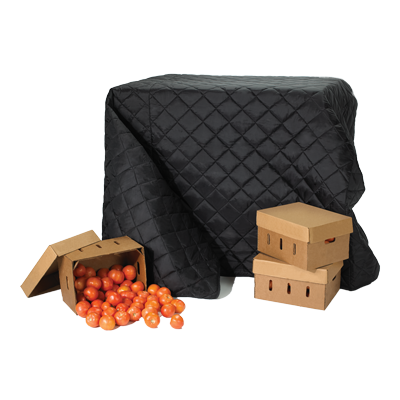 These Insulated Pallet Covers can provide an extra layer of protection on single-temp or multi-temp trucks as well as provide protection for products stored against a bulkhead. When less than pallet-load quantities are placed on the truck, our 150UB and 153UB Insulated Bags are ideal. During deliveries, some stops only need one or two single items rather than a whole case. This is where the driver balances those individual items on top of boxes on a hand truck, which can lead to product damage if it falls off or makes for more trips to the truck. Our 154DC Hand Truck Pouch attaches to any hand truck and can easily fit loose products, paperwork, pens, scan gun and a clipboard. This pouch can save you time and money on every delivery and should be on every hand truck pouch.